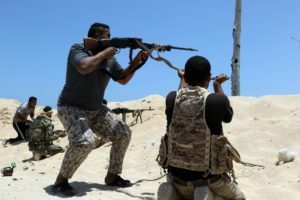 The two months-long battle to drive Islamic State of Iraq and Levant (ISIL) out of Sirte has seen 241 soldiers loyal to Libya’s unity government killed and more than 1,400 wounded. GNA forces have been shelling and carrying out airstrikes on the center of Sirte, but ISIL’s jihadists have kept the GNA forces back with sniper fire and mortars. The UN-backed Government of National Accord (GNA) began the operation to recapture Sirte in May. ISIL jihadists overran the coastal city, the hometown of late dictator Col. Moammar Gadhafi, in June of 2015. “The toll of martyrs after two months of fighting is 241 dead and more than 1,400 wounded,” a medical source in Misrata told AFP. The command center of the GNA forces for the military operations against ISIL is in Misrata, 200 kilometers (120 miles) east of Tripoli. “Some of the wounded are treated in Libya but others have been transferred abroad, to nearby countries such as Turkey, Tunisia and Italy,” said the source who requested anonymity.